Experience a cozy home-like atmosphere at our Daughter’s Home. The rooms are spacious, well furnished, self-contained and duly maintained. They are airy and provide for a great view. The hostel also has Internet facility and can be accessed on chargeable basis for hostel residents only. They come with the basic amenities like bed, table, chair, small cupboard and electrical fittings. There is 24-hour electricity with power back-up and water supply through reverse osmosis filter system also. Hostel residents have the facility of water heater for winter, coolers in summer season and laundry is in front of hostel premises. A recreation hall with facilities for indoor games like chess, carom encourages students to make good use of their leisure time. Cable TV is also provided in every block. All units strive hard to ensure that the residents enjoy their stay here! The Daughter’s Home family including authorities, the hostel resident faculty members and the students all dine together to have a feeling of belongingness. The central dining hall, having ample capacity, well equipped provides well-planned, varied, balanced and appetizing vegetarian food prepared in strict hygienic conditions. The day starts with serving of bed tea / milk and break-fast early in the morning and ends with serving of nourishing milk before going to bed. The eyes seek perfection and persistently look behind every slightest lacuna on the campus. Smooth functioning of the mess ensuring quality food preparation, appetizing varieties and mouth-watering aroma is the sole realization of any spectator. Daughter’s Home is well equipped with essential amenities and provides a conducive environment for a comfortable and meaningful stay. 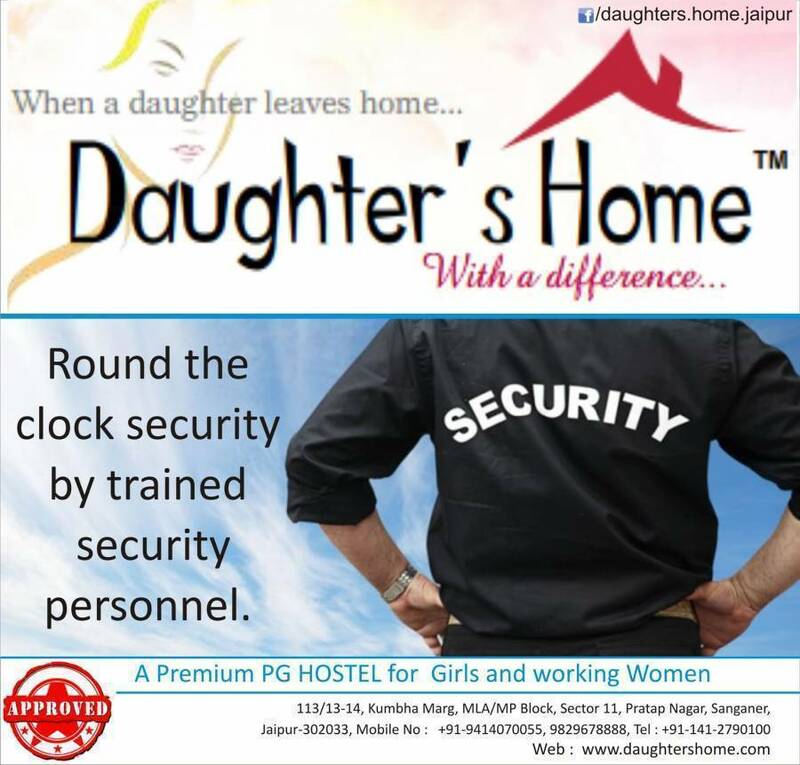 Daughter’s Home, being a hostel for girls, has looked into the security aspect with a great deal of care. Professional security personnel, guard the Daughter’s Home, twenty four hours. A day and their unflinching vigilance make the campus thoroughly secure. To maintain the decorum of the Daughter’s Home, every one has to follow some instructions, so that the security purpose can be achieved. Lady resident warden specialized in hospitality management is available round the clock. Indeed the comforts that Daughter’s Home provides to the residents are topped by a sense of anxiety free heaven that makes it a safe and secure home away from home.